The Adams fly requires no introduction; it is probably the most famous fly in all of history. It’s carried in the fly boxes of fishermen in every country where trout are found. It would probably be an understatement to claim that the Adams fly, with all its variations, has collectively caught more trout then any other fly pattern in existence. It can be used in a variety of waters, and, with its brownish-grayish coloration it imitates generally acceptable food items found almost anywhere in trout fishing environments. Most fishermen would agree that if they were allowed to use only one dry fly pattern — it would be the Adams (or some variation there of). Between 1847 and 1906 the lumber industry brought merchants and settlers to the woods of northern Michigan. Many small towns centering around the logging industry began to spring up. Most of these, now vanished towns, were founded on the banks of the major rivers like the Au Sable, the Manistee and the Boardman. The small village of Mayfield was located near Swainston Creek, which flowed into the Boardman River over a mile away. Although not a major logging town, Mayfield was still tightly tied to the industry having been the home to three major saw mills and a gristmill. Leonard Halladay (1872-1952) was originally from New York but his family, lured by the lumber industry, migrated to Mayfield when Leonard was just a young boy. As a growing young man he would see the last of the grayling and brook trout whose demise was brought about by over fishing, and habitat destruction from the logging industry. It was around this time when Michigan began introducing the German brown trout to its rivers. By the age of 17 he had started tying flies and was already acknowledged as an accomplished fly fisherman. He worked as the plant operator for the gristmill that been converted into a hydroelectric plant to produce electricity for the town of Mayfield. Around the turn of the century Leonard and his wife Rilla (Mary) ran the Mayfield Hotel, providing rooms and food for the lumberjacks and tourist in the area. Along with tying flies Mr. Halladay’s many interest were hunting, raising hunting dogs and raising chickens to produce his own hackle. He was a man short of stature and compensated for it by walking fast and taking long strides. He also had the interesting habit of taking a 20 minute nap after lunch, no matter where he was. As the logging industry waned, the Boardman River was rapidly beginning to attract large numbers of fishermen from the surrounding states. At this time Leonard started a guide and livery service catering to the visiting fishermen. Mr. Halladay guided and fished with many people, among them was a man by the name of Mr. Charles F. Adams, and Lon B. Adams, his son. Both were fly fishermen, and attorneys from Lorain, Ohio. Later in life, Charles went on to become a judge. The two men summered at Arbutus Lake just north of Mayfield and loved to fish the Boardman River. Both men knew and fished with Leonard Halladay, on a regular basis. What was Halladay’s motivation for tying that particular design? Most historians say that Mr. Adams, literally, brought him some of the insects that he wanted Halladay to imitate when he designed the fly. Others chronicle that Mr. Adams did not produce any insects, but rather described the insect to Halladay with specific directions as to how the fly was to be designed. If this is true, that would make Mr. Adams the real creator of the fly. Although these different versions cast some doubt as to who first created or designed the fly there is no question that Mr. Leonard Halladay first tied it. To further add to the controversy; Mr. Lon Adams (son of Charles) wrote a note to a friend, years later, claiming, “ I’m real proud of the fact that back in 1923 I designed the Adams fly and had it named after me by Leonard Halladay, the original tyer.” We will probably never know what his motivation was in writing that note to his friend, but historically there is no support for his claim. Leonard Halladay, himself, did in fact claim that he had designed the fly. The many arguments, controversies and debates over the design of the original historical pattern are without merit. On several occasions Mr. Halladay, himself, openly discussed the original pattern with others. Hook: #12 or #14	Dry Fly Hook(The manufacture of the hook is not known. Thread: Gray (Most historians agree on this, although some insist that it was black). Wings: Narrow neck feather of Barred Plymouth Rock rooster, tied ‘advanced’ forward and in a semi-spent manner. Hackle: Mixed, from the neck feathers of Barred Plymouth Rock and Rhode Island Red roosters. Tied to the original Halladay pattern using gray wool yarn. It is safe to assume that Halladay tied and sold the fly and also shared it with the customers he guided. The fly gained popularity quite quickly. Although we do not have an exact date or location; within just a couple of years the first modification of the Adams took place. Tiers began replacing the gray wool yarn with muskrat fur. For all practical purposes the color is the same but the floatability increased. The wings, hackle and tail remained unchanged. Virtually no difference in color. As the fly continued to grow in popularity its reputation was spreading further and further from its point of origin. Some time in the late 20’s or very early 30’s the Catskill tiers influenced the next modifications: the wings were pulled back from the ‘advanced’ position and they went from ‘semi-spent’ to upright and divided. The body was well trimmed and tapered in the typical Catskill style. The taking on of the Catskill influence. The reform of the tail from two golden pheasant tippets to a tail of mixed grizzly and brown hackle fibers is the last major metamorphosis of the Adams. We do not have an exact date or the name of the tier who first altered the tail. We are not even sure from which part of the country the modification started. What we do know is that the original tail began to disappear and be replaced with the new material as early as 1938. Tiers from years ago observed a strict code of pattern ethics. Modifications to fly patterns were slow to change. The Adams had already been modified, much too fast. A burning desire to retain some semblance of the original pattern caused the tail to survive in some fly shop up until the early 1960’s. To my knowledge, no one ties the fly with golden pheasant tippets today, except for nostalgic reasons. Historically, the Adams was and is important. Not only for it universal ability to catch fish, but also because it arrived on the seen when American fly tying was coming into its own. We were beginning to break away from the classic British patterns. Styles and patterns were being altered, created and adapted for the different types of fishing situations found in this country. American fly fishing authors came into their own, flooding the market with books on casting, fishing techniques and fly patterns. Leonard Halladay not only created the Adams fly but is attributed with the development of the Female Adams, as well. His vice produced other famous creations of the time including Halladay’s Hair Stone, Halladay’s Michigan Caddis and the Dr. Kirgin. History is not always as clear and uncluttered as we would like it to be. In this article I’ve attempted to provide historically correct information to you on both Leonard Halladay and the creation of the first Adams fly. Although there are few if any, surviving original Adams flies (that can be supported with documentation), I have done my best to try to re-construct what the original fly, and its transitional cousins looked like. I hope you have enjoyed the effort. Tom Deschaine is a retired biology teacher from Michigan with over 25 years experience on the water and at the bench. He owns the website, www.michigandryflies.net, where he is preserving trout fly patterns and recipes created by Michigan tiers as well as patterns designed to be used on Michigan waters. He is also compiling biographical and historical information on the classic fly tiers of Michigan. 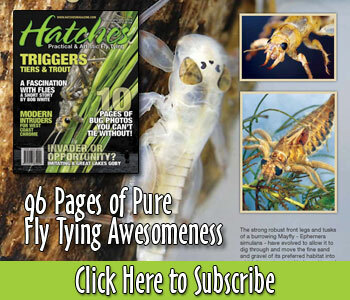 What a wonderful article to read about one of the all time favourite trout flies . Really interesting to learn about how this great pattern came to be . Great information, i appreciate those that take time to keep the history of our great sport. Keep up the good work!! Thank You.Fly fishing society need roots ,need tradition to be live. I find this article to be most accurate in all respects of the history of the “Adams Fly”. Charles F. Adams was my Grandfather, on my mothers side, and I was raised spending my summers at Arbutus Lake. I was told the history of the fly all my early life. I knew Len Halladay and his family, and some decedents are still living in that area, and I can remember him as shown in the picture. His home was stones throw from the Mayfield pond. My father, Dr. Cloyd Felix, was also a trout fisherman, but not nearly to the extent of my grandfather. During the winters he and my grandfather would work on different versions of the fly also. I agree with the doubt of my uncles’ involvement in the creation of the fly due to his age at the time. A small park has been created in Mayfield at site of Mr.Halladays’ home, which actually was hotel, and a small momument with a plaque errected honoring Charles Adams and the Adams Fly. A wonderful fly and story. I do not know of any fly-fisher that does not use this beauty! Many flatering comments have been made about my article. There are many people who will tell you that this article is not factual. The truth of the mater is, that it is factual. Yes, there were many versions of the ‘Adams’. Even Len Halladay, himself, eventially tied the more popular versions of the Adams (wings upright and divided). But, the original pattern, presented in the article, is in fact the original pattern. Consider that back when these classics were first tied all one had to go on was word of mouth and the actual finished fly to prove who designed and tied it. Nowdays we have digital photos with time and date stamps and people patenting their designs. While I love to hear or read ALL of the histories of these great flies, I am most thankful someone wiser than I put one together and shared it with other fly fishers and tiers! I began tying the Adams with the original dressing described in the article. I still tie it but in sizes 16 and 18 and with a tan fur body. What a nice wright up on one of the most popular dry flies around. Full disclosure: Lon Burton Adams was my grandfather. Like Mr. Felix, I grew up hearing stories about the creation of the fly, and you might guess that these stories were not entirely consistent with the ones you have identified as the historically accepted ones. Rather, I was told by my grandfather that he and his father directed Mr. Halladay on the design, through a series of them, in a trial-and-error process of improvement. You might imagine that this was a point of particular pride, and I will say that my grandfather was never anything but a truthful person, to the best of my knowledge. That said, note that what we have here are essentially two oral histories, from two different sources, and we have absolutely no way, as far as I can tell, to determine which contains the truth, and which does not, at least on this point. (I should mention that I have the family papers, and they don’t shed much light on the question.) Interestingly, both oral traditions agree that the fly is based on insect models, so that claim is credible, but differ as to who was primarily responsible for the design. Note as well that it is necessarily the case that the unnamed historians you rely on themselves were relying on one or another of these oral traditions, so an appeal to what is historically accepted in this case is unjustified (because it is circular). Thus, at this point the only thing we can say with certainty is that both Mr, Halladay and my grandfather and great-grandfather claimed to have major roles in the design, and that the exact roles they each played we are not in a position to determine with a degree of probability that would be accepted by professional historians. Any other claim goes beyond the evidence, as far as I know it, and represents a form of special pleading. The lesson I take from this is that oral histories need to be treated with special care, especially when we have vested interests in one or another version of the stories. I would be most interested in seeing your sources for this, for I may have missed something. You can use the email I’ve used here. Now here is the real story, I know first hand this to be true. The Dam,at the river or Mayfield pond, while daddy and gramps fished. My dad most liked to fish the pond after dinner. I was not born when the Adams fly was tied. However, my dad,Burt Adams, told us many times he designed it, based on the bugs,the natural diet of the trout. He and Holliday worked together on this project, based on the bugs my dad provided,and my dads input the Original Adams fly was born and named for my grandfather,C. F. (Charlie)Adams. That is the truth as I know it, not orall tradition. Fact is fact. One other note, Tom Spademan is right. We are not in the habit of making things up. Now , anther fact, is my Dads interest in river conservation. He was one of the founding fathers of Trout Unlimited. He worked very hard at getting river conservation on the rivers in Michigan. I remember his TV debut when he talked about this in TC. This is a not a man who would create fantasy, or false claims. Eda Sargent has nothing to do with our family, except she taught me to ride a horse. To List her as a reference is really stupid, not at all relevant. What could she add abt. my family this is poorly researched. This makes me mad as can be, all you people think you know about this, try to take credit for something you know nothing about, discredit my father who is the one person who can claim his right to this. You should be ashamed, my dad is a honorable person, did not lie abt designing the Adams Dry fly, and I challenge anyone of you to prove me wrong. For Len Halladay’s version of the origin of the Adams, the reader should view “Grandpa’s Story: The Adams Fly” at youtube.com and read the “The Legend of Halladay and His Adams,” The American Fly Fisher (vol.42, no.4, Fall 2016, page 18).